Missed the first year of Deep Water magazine? Now you can order the complete Volume One in a single print magazine of 232 perfect bound pages. Save 20% off the regular cost of purchasing each magazine individually when you order this set for only $54.36 (shipping & taxes not included). We are thrilled to present the next edition of Deep Water Magazine. This large double issue features a look at the legendary George Xu, plus the second part of our indepth interview with Dr. Yang Jwing Ming discussing the aspects of Internal Vs. External, an article by Guru Steven Benitez, Professor Kevin Wallbridge, Shifu Neil Ripski, Sensei Tom Gillis and so much more! Grab a digital copy or print edition. Remember to send us your letters to the editor, comments, questions or suggestions. We sincerely appreciate your thoughts and input. of Jonathan Bluestein's Research of Martial Arts. Thank you to all who entered, and a special thank you to Jonathan Bluestein for his generous support of Deep Water Magazine. Welcome to Deep Water Magazine, a martial arts publication that strives to inquire into the deeper aspects of the martial arts from the point of view of the Masters themselves. 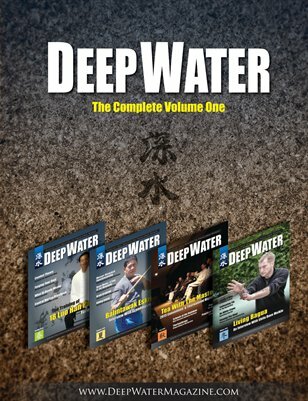 Unlike other magazines that focus on specific techniques, or highlight the differences between martial styles, Deep Water Magazine looks beyond the surface and gets into the heads of real martial Masters, bringing us their thoughts in their own words. Thank you for your interest in the Deep Water Magazine. This quarterly published magazine is now available in three formats. A free, preview edition, a full PDF digital edition, and a beautiful full color printed copy is also available on demand. Our goal is to bring together real wisdom regardless of style or country of origin. Deep Water Magazine is produced by Deep Water Martial Arts Ltd. and distributed in print and digitally through HP Magcloud.